Founder of Por Vida tattoo, Bale started tattooing in 2005 and specializes in freehand black and gray style tattoos. When Bale is not working on his next clients tattoo, he enjoys illustration and reading. 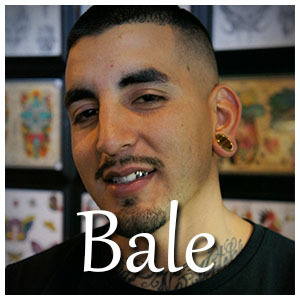 Bale enjoys following in the footsteps of other legendary tattoo artists and enjoys most, keeping the tradition going. He always brings his passion for tattoos and art to any project he takes on.